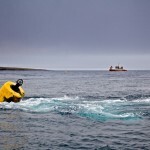 The European Marine Energy Centre (EMEC) is delighted to welcome Spanish tidal energy developer Magallanes Renovables to their tidal test site at the Fall of Warness in Orkney, Scotland. 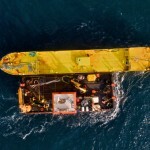 The successful installation of their second generation (2G) 2MW tidal platform ‘ATIR’ took place on 16th February and marks a major milestone in the Ocean_2G project, which aims to test, validate and pre-certify Magallanes’ device. “The journey to Orkney was no mean feat, but the team managed to skilfully navigate their way in harsh weather conditions, through some of Europe’s most challenging seas. “We are very pleased to have the ATIR installed at EMEC. This marks a major milestone for the project and is a great achievement for our dedicated team after years of building up to this point. 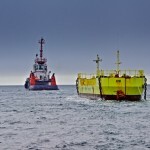 “The next step in the project will be to start the testing programme at the Fall of Warness. We look forward to demonstrating the outputs of this pioneering prototype and generating electricity into the national grid in the near future”. 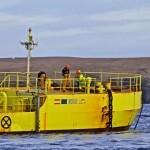 “We are thrilled to welcome Magallanes back to Orkney following their 1:10 scale tests at EMEC in 2014. 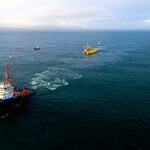 By deploying the ATIR here, Magallanes have joined the family of technologies benefiting from the UK’s centre of excellence for marine renewable innovation. 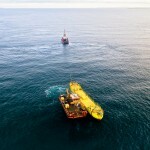 “The successful installation of the ATIR at the Fall of Warness was due to careful planning and an effective working relationship between Leask Marine, Magallanes Renovables and EMEC,” he said. “Marine operations at this time of year can be challenging, however by utilising the weather windows and skills of the team, it allowed this successful operation to take place. This also proves that marine operations don’t have to be restricted to summer months.